Some days Crabby Old Lady despairs. Just when she thinks elders are making a few strides forward in gaining respect from the media, someone kicks the chair out from under her. And as often as not, it is an elder who does so. Good god, it’s not the young people whose statements are outdated; it’s old people themselves and today Crabby bestows the Ageist Elder Award to Ms. Paulson. Perhaps Ms. Paulson thought she was being funny sticking “sadly” next to her laments about how terrible old age is. Crabby couldn’t find a laugh anywhere in this ageist, Uncle Tom piece. “Sadly” the woman is no humorist. And, “sadly”, she does not understand the damage she does to all elders by perpetuating the same old, same old stereotype. But Crabby suspects nothing better can be expected from someone who is so cynical as to yawn at fireworks. 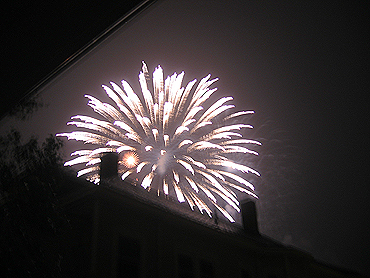 Here’s a photo Crabby took from her deck during the Fourth of July celebration in Portland, Maine. Even in the rain, it was an “ooh” and “aah” display. Yawn? Who could be bored with fireworks? Easier to blame dullness on age than one's self. However, non-appreciation and taking things for granted is a malady that afflicts people of all ages. I'm among the oldest in my homeschooling group. The younger women let me play. Like the kids, we don't divide people into grades. And btw, I never found the discussion of clothes fascinating. Music, books and men still interest me, but since I no longer am driven by a need to procreate, my discussion and choices are a lot more intelligent. This is a serious question, not trying to be inflammatory. I'm not yet an "elder," but I am beyond middle age (55). What are your specific objections to any of the quotes you cited? For the life of me, I couldn't find anything ageist or wrong with them. They seemed to reflect MY reality of aging, even though they were some of the more poignant/negative aspects -- and there are positives as well. If I say my body is past its prime of beauty, and that I have aches and pains, is that ageist? If I say I look around and find myself to be the oldest woman at work, and that bothers me, how is that ageist? To me, it just sounds honest. I truly am puzzled. But I'd love to hear your specific objections to each of these quotes, because I may just not have my consciousness sufficiently raised yet. She sounds like a jaded poop. And you don't have to be old to exhibit those characteristics. Maybe she needs to "re-invent" herself! Years ago, on the first day of Music Appreciation class, the professor, after allowing Beethoven's 9th to play long enough for the "too cool" students to begin fidgeting, wrote on the chalk board: "Are you bored?" Just as they began to clap he then wrote: "Or are you boring?" Perhaps Ms. Paulson should ask herself this question. I don't think it's necessarily ageist to be honest about some of the negatives of aging. But who ever details the considerable negatives of youth?! Seeing the negatives with fresh eyes is one thing; seeing them through the eyes of conventional expectation is another -- a self-fulfilling prophecy. I love the subtitle of your blog, "what it's really like to get older," because what it's really like is full of surprises that contradict what we've been taught to expect. The expectations come in two flavors: 1) aging is all loss and decrepitude, and 2) you can age without changing, and feel and look like you were young. Neither is true. Age is very different from youth, but in some ways it actually brings more power and pleasure, and confidence, perspective and equanimity. If you look at it as all loss and negatives, you'll miss it. I'm with Annie. To deny that there are changes with aging is downright untruthful. What we have to remember is that although our bodies change, the essence of who we are changes in ways that we can control by our outlook, attitudes etc. Anyone who wants to discriminate against the wisdom, perspective, contentment etc. that age can bring is the one that is losing the battle! I'm glad to be older. I have no desire to be young again. It took a long time to get to here and yeah, I have aches, etc. but I feel freer than I ever did when I was young and that's a good thing! Count me among those who were not particularly offended by the article. The comment about fireworks says more about the writer’s personality than her age. It’s not fun to have your metabolism slow down so the pounds pile up or to have your eyesight fade so you need reading glasses or to have memory lapses so you buy post-its in bulk at Sam’s. But these things happen if you are lucky enough to live that long. As does becoming the oldest person in your office or department. Upon reading Ms. Paulson's article, I found her first sentence indicative of the less than humorous tone of her writing "...one of those nasty eye-opening experiences..." she said. I can't think of any stage in my life when I would have characterized awarenesses of myself as being "...nasty eye-openers..." including at midlife and in later years, and not because I haven't had some pretty informative insights. Personally, I get more than a little tired of writers who resort to focusing on the same old stereotypical descriptions of any age group, then think it passes for humor. Stereotype descriptions are worked to death under the guise of being humor. I can and do appreciate a good joke with the best of them, but the foregone conclusion she expresses that what she describes constitutes old age is just not true for all and perpetuates the myths that too many believe. One feature I value about TGB is that aging is viewed "...like it really is." I've never read any denial here or failure to acknowledge that a wide variety of changes do occur for some, as in any age group. I would expand Marilyn's observation to say Ms Paulson's whole, supposedly humorous article "...says more about the writer’s personality than her age." Aging, like any other stage of life, is not the same for everyone. To stereotype it as a boring, pain filled, march to the grave is as wrong as trying to deny the changes that inevitably come with advanced years. I agree with Darlened....Sterotype is erroneous. We have many different experiences with age. Ms Paulson does seem to be very receptive to the negative aspects of age - and seems even to turn the positive aspects into negatives. No longer drinking and babbling on about trivia? Yayyy! Let's actually use our brains for something useful. Oldest woman in the department? And? Husband - I'm not sure if he needs a good smack for making a comment that must hurt her, or she does for not construing it as a compliment. There are plenty of bad things to be said about any stage of life (god knows I'm glad to have escaped teenagehood) - but you aren't going to hear 20-somethings say "urgh, life is so hard when you're young, ignorant and insecure", are you? Why? Because they're too young and ignorant to know it! Why do we even listen to them? I think you find negative people everywhere - and they are just looking for a hook to hang their feelings on - and now they can hang it permanently onto "Age". Cracking photo, by the way! The number one question I'm asked when I'm on the radio or TV is, "Isn't 60 the new 40?" "No. See, here's the difference: at 40, you still have kids at home, a job, and the juggling act; you're in menopause or perimenopause; you're still hoping the elevator to the top of the career building doesn't stop and discharge you; you don't have enough time to do the things you love but you still think you have all the time in the world to make your dreams come true." Looking back at 40, I wouldn't trade for any of it ... what gnaws at me in the piece you posted is that she has not stopped playing the psychological tug of war with the past -- over 60 brings with it a peace and a power that not only needs our acknowledgement and celebration, it needs our full engagement to ride the world of as much evil as possible before we shuffle off. Ageism, even in its "I Feel Bad About My Neck" humor, accomplishes the same goals as sexism and racism: it cripples the warrior within us, and the world is less for it. Of course, if I'd bothered to proof my post, I would have changed it to RID the world of as much evil...etc ... and that evil would include typos. We arent getting older,just wiser,and the aches and pains are growing pains,and who whants to go to the grave in a well preserved body? rather get there with a bang and say what a ride!! !